The opening book of the sci-fi quartet tour de force by Dan Simmons, Hyperion, begins the tale of the story of the Time Tombs, The Shrike, the Hegemony, The Webworld, and the fate of seven pilgrims called to stop the reversal of time and destroy the scourge of a monster so hideous and extreme that people worship it. 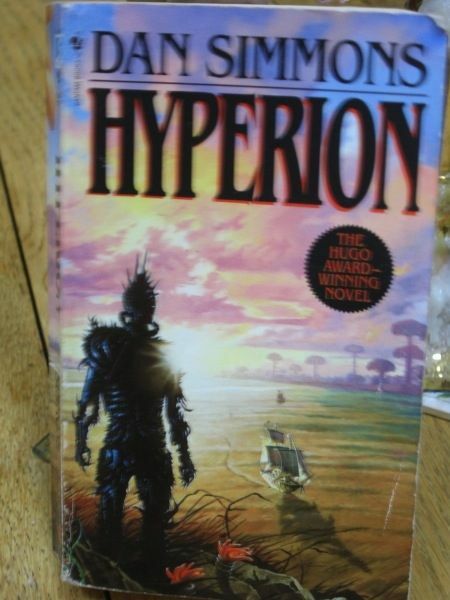 It is on the planet Hyperion, far in the future, where these trials and tribulations occur. The pilgrims long journey takes them to the Time Tombs where, 26 years earlier, a young archeologist, Rachel Weintraub, was stricken with a disease that has made her age backwards. Now just a few days old and growing younger each day, she returns in her father’s arms to the place where it all started. She, her father, and five other travellers hope their journey will not only reverse Rachel’s horrible sickness, but also solve the riddle that puts the entire known universe at risk. The book received the Hugo Award for outstanding fiction.